Welcome to Rothguitars Picture page. Welcome to Rothman's Guitars Picture page. I have included a number of Guitar pictures from my inventory of guitars. Also are a number on interesting guitars that I have run across in my guitar business. for those of you who might be new to us. My grandfather David Rothman, who started Rothman's Department Store, founded us in 1918. Though our 80 years we have become a fixture in downtown Southold. An old time General Store catering to the local and tourist trade of the North Fork, we still strive to remain one of the last remaining "General Stores" on Long Island. We probably are one of the most unique Music stores you will ever see. People like Albert Einstein and Benjamin Britten graced our halls, satisfying their musical needs. Einstein would play in Musical Quartets, organized by my grandfather, in the same building where we are today. came into the picture. Now being a Martin and Taylor Guitar Dealer and searching out top quality instruments, we have become Eastern Long Island most complete Vintage guitar store. I have been involved in the Music Scene for the last 20 years, playing with several different bands. Whether it is Folk, Rock, Bluegrass, Jazz or blues, I seem to be in touch with what music is happening. Whether it's playing with "The Jody Leah Jazz Quartet," "King Scallop and the Oysterettes, " or sponsoring Jams in the local Clubs, I try to follow the music of the East End. I've been active in the music activities during the first Greenport "First Night"? along with several concerts sponsored by The Arts in Southold Town. This is a Harmony guitar with a Gene Autrey Graphic from he 40's. 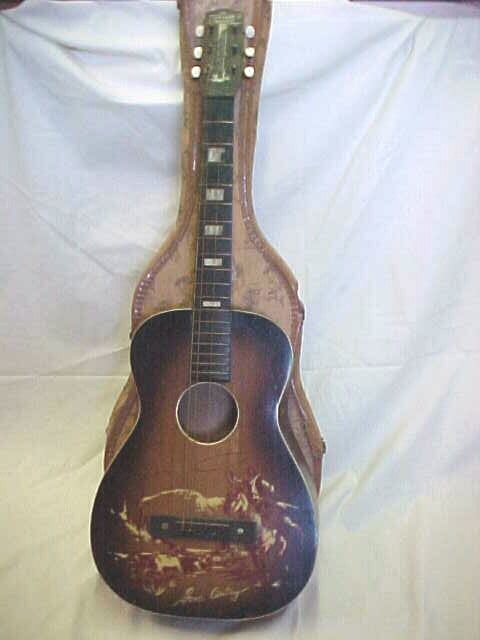 These Stencil guitars are quite popular and in demand, more as wall hangings than players. Click on the guitar to find out more about Harmony guitars and the Harmony Guitar company.